Active Coils - Those coils which are free to deflect under load. Angular Relationship of Ends - Relative position of hooks or loops of an extension spring (or ends of a torsion spring) to each other. Baking - Heating of electroplated springs to relieve hydrogen embrittlement. Block - Length of a compression spring when deflected under sufficient load to bring all adjacent coils into contact. Buckling - Bowing or lateral displacement of a compression spring. This effect is related to slenderness ratio L/D. Close Wound - Adjacent coils are touching. Closed and Ground Ends - Same as Closed Ends, except the first and last coils are ground to provide a flat bearing surface. Closed Ends - Compression spring ends with coil pitch angle reduced so they are square with the spring axis and touch the adjacent coils. Closed Length - Length of a compression spring when deflected under sufficient load to bring all adjacent coils into contact. Coils Per Inch - Distance from center to center of wire in adjacent coils in an open-wound spring. Deflection - Motion imparted to a spring by application or removal of an external load. Elastic Limit - Maximum stress to which a material may be subjected without permanent set. Endurance Limit - Maximum stress, at a given stress ratio, at which material will operate in a given environment for a stated number of cycles without failure. Fixture Tempering - Restraining parts during tempering to improve dimensional control. Free Angle - Angular relationship between arms of a helical torsion spring which is not under load. Free Length - Overall length of a spring which is not under load. Gradient - Spring gradient, or change in load per unit of deflection. Heat Setting - A process to prerelax a spring in order to improve stress relaxation resistance in service. 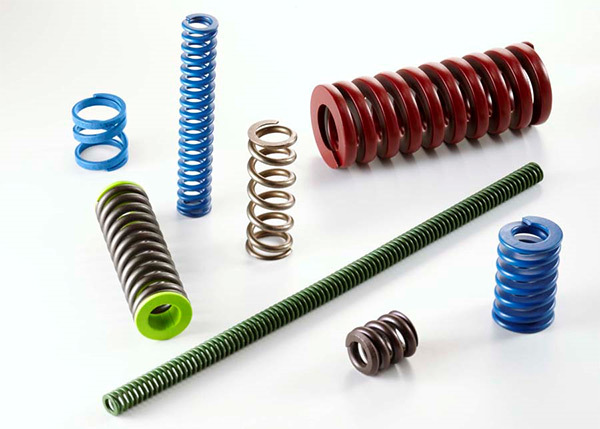 Helical Springs - Springs made of bar stock or wire coiled into a helical form. This category includes compression, extension and torsion springs. Hooks - Open loops or ends of extension springs. Hysteresis - Mechanical energy loss occurring during loading and unloading of a spring within the elastic range. It is illustrated by the area between load-deflection curves. Initial Tension - A force that tends to keep coils of a close-wound extension spring closed and which must be overcome before the coils start to open. Loops - Formed ends with minimal gaps at the ends of extension springs. Mean Diameter - The average diameter of the mass of spring material, equal to one-half the sum of the outside and inside diameters. In a helical spring, this is the equivalent to the outside diameter minus one wire diameter. Modulus in Shear or Torsion (Modulus of Rigidity G) - Coefficient of stiffness used for compression and extension springs. Moment - A product of the distance from the spring axis to the point of load application, and the force component normal to the distance line. Natural Frequency - Lowest inherent rate of free vibration of a spring vibrating between its own ends . Patenting - The process of heating carbon steel above its critical temperature and cooling at a controlled rate to achieve a final pearlitic microstructure. Pitch - Distance from center to center of wire in adjacent coils in an open-wound spring. Plain Ends - End coils of a helical spring having a constant pitch and ends not square. Plain Ends, Ground - Same as Plain Ends, except wire ends are ground square with the axis. Rate - Spring gradient, or change in load per unit of deflection. Residual Stress - Stress mechanically induced by such means as set removal, shot-peening, cold working, or forming. It may be beneficial or not, depending on the spring application. Set - Permanent change of length, height or position after a spring is stressed beyond material's elastic limit. Set Point - Stress at which some arbitrary chosen amount of set (usually 2%) occurs. Set percentage is the set divided by the deflection which produced it. Set Removal - An operation which causes a permanent loss length or height due to spring deflection. Shot Peening - Blasting the surfaces of spring material with steel or glass pellets to induce compressive stresses that improve fatigue life. Slenderness Ratio - Ratio of spring length to mean diameter L/D in helical springs. Solid Height - Length of a compression spring when deflected under sufficient load to bring all adjacent coils into contact. Spiral Springs - Springs formed from flat strip or wire wound in the form of a spiral, loaded by torque about an axis normal to the plane of the spiral. Spring Index - Ratio of mean diameter to wire diameter. Squared and Ground Ends - Same as Closed Ends, except the first and last coils are ground to provide a flat bearing surface. Squared Ends - Compression spring ends with coil pitch angle reduced so they are square with the spring axis and touch the adjacent coils. Squareness - Angular deviation, between the axis of a compression spring in a free state and a line normal to the end planes. Stress Range - Difference in operating stresses at minimum and maximum loads. Stress Ratio - Minimum stress divided by maximum stress. Stress Relief - A low temperature heat treatment given springs to relieve residual stresses produced by prior cold forming. Torque - A product of the distance from the spring axis to the point of load application, and the force component normal to the distance line. Total Number of Coils - The sum of the number of active and inactive coils in a spring body. Little, R.E. and E. H. Jebe., Statistical Design of Fatigue Experiments. New York: John Wiley & Sons, 1975. Blake, A., Design of Curved Members for Machines. New York: Industrial Press, 1966. Bisshopp, K. E. and D. C. Drucker., "Large Deflection of Cantilever Beams," Quarterly of Applied Mathematics, vol. 3, no. 3 (1945), p. 272. Maker, J. H., "Steel Springs," Metal Handbook. 9th edition. Metal Park: ASM, vol. 1, (1978), pp. 283-313. Peterson, R. E., Stress Concentration Factors. New York: John Wiley & Sons, (1974), p. 231. Maier, Karl W., "Dynamic Loading of Compression Springs," Product Engineering, (January 1954), pp. 162-167. "Dynamic Loading of Compression Springs," (March 1955), pp. 162-172. "Surge Waves in Compression Springs," (August 1957), pp. 167-174.